I am really enjoying seeing all of your Fall decorating and I had to get busy adding Fall to our house. Many of you know our family room is already decorated in Fall colors with the green walls and painted faux leather ceiling. Though I do love the room this time of year, the dark colors make it hard to get a decent picture. Add the overcast days and there is no chance of a good picture. I couldn’t wait any longer to show you what I have been up to. In the picture below you can see how the colors on the mirrors tie in with the ceiling. Below is how the mirrors looked when I bought them. I knew the black frames would have to go so they were painted with the homemade chalky paint. No sanding or priming and two coats covered the black shellac finish. Here is another victim of the DIY chalky paint. 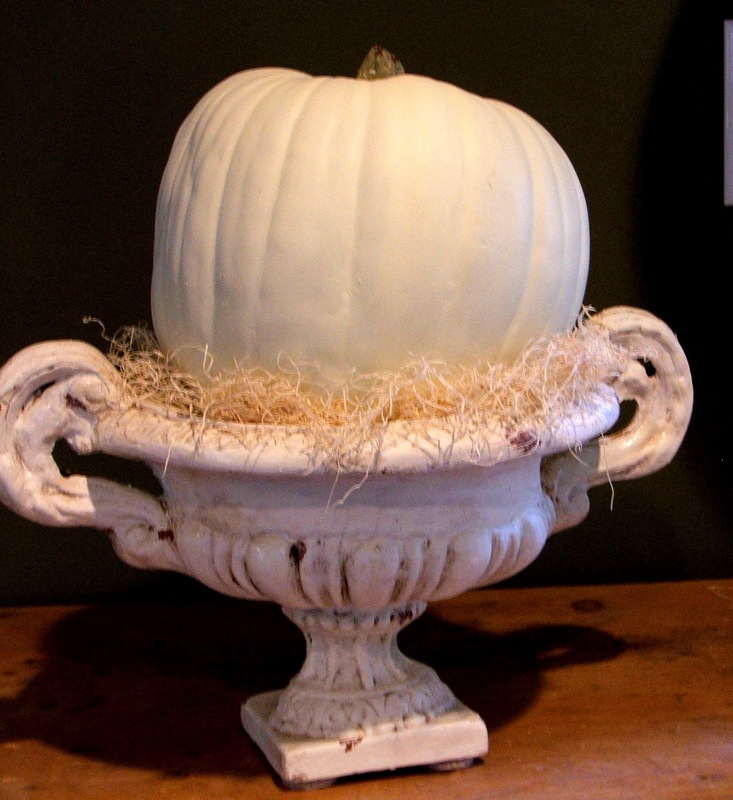 The $3.00 GW urn above is plaster and had a high gloss paint finish originally. I painted it with white paint mixed with calcium carbonate. I must say the calcium carbonate powder is my favorite additive just because it is a finer powder than Plaster of Paris. Several of you have asked where I bought it and here is the link Swanson Vitamins. I wanted the urn to look like an old terracotta one so I mixed some brown and orange craft paint and added it in spots to look like it had been chipped. In the picture the spots look red but in person they are terracotta colored. Ralph Lauren Smoke glaze was applied and quickly wiped off. a rope are a favorite and they were purchased at Michaels after Thanksgiving sale last year. 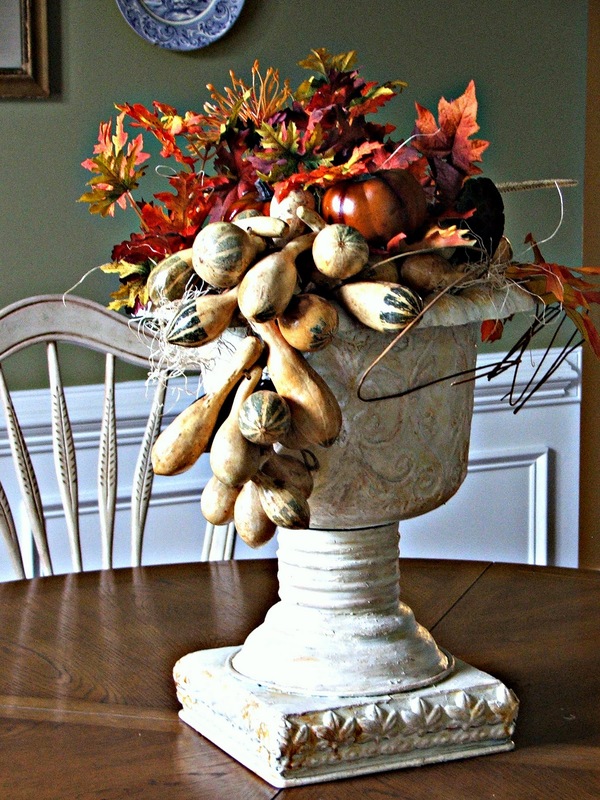 I added this simple arrangement on our kitchen table using a wine basket and large pine cones. I hope you enjoyed seeing the new paint projects and Fall decor. I’ll see you Wednesday evening for the Open House Party. Looks great! Love all the DIY updates 🙂 Don't you love a good chalk paint recipe! Looks amazing…your home is lovely! Can't wait to try the homemade cp! 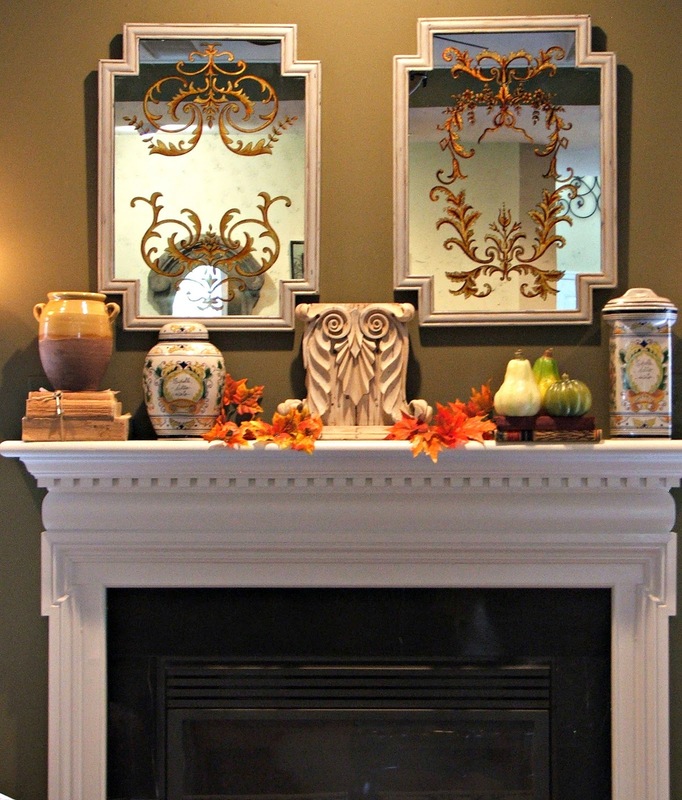 Loving your mantel and other gorgeous Fall vignettes! Thanks for sharing, also your chalk paint recipe is cool and i have to try it! Everything looks amazing! You really have Fall..wall to wall! You have a beautiful home, Sherry! 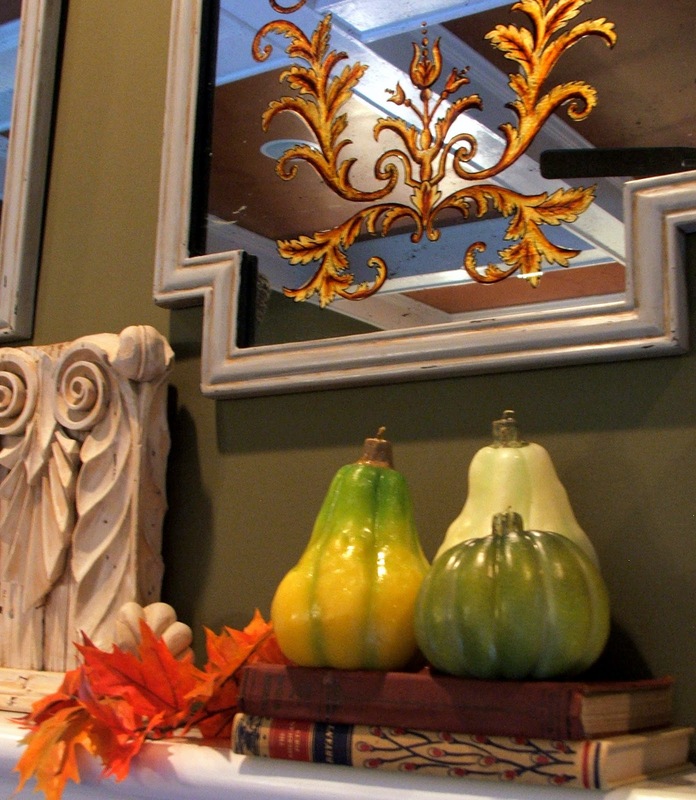 Sherry, you beautiful decor is putting me in the mood for fall! I love the mirrors, and your updates to them! All your fall decor is beautiful!!! Love those mirrors and that GW urn is my FAV!!!! LOVE those mirrors Sherry! They are beyond fabulous! I've been shopping the house and have an urn that is just begging me to paint it with some fake chalk paint! I also have three old huge windows that I have dreaded painting because I didn't want to sand and prime them first…they may be my first victims of this new rage! Thanks for showing us your pretty fall decor too! Great mirrors! I too am on the hunt for a fabulous mirror for above my mantel. I love all the other decor too! I LOVE your mirrors and your mantle display is so pretty and elegant. I love all the fall touches you've added, simply gorgeous! Great updates Sherry. I'm an urn addict, so I love those. Your mantel looks fantastic. That a girl, keep the chin up, make that paint and move forward. Richard from My Old Historic House. Looks wonderful! Im still looking around to see what could be painted around here… Just a question, do you have to 'seal' the diy chalk paint with a poly? Does it chip off easily? I love the idea of making our own chalk Paint for so much less cost! omgosh…these are beautiful. sooo pretty. Looking all so beautiful Sherry. 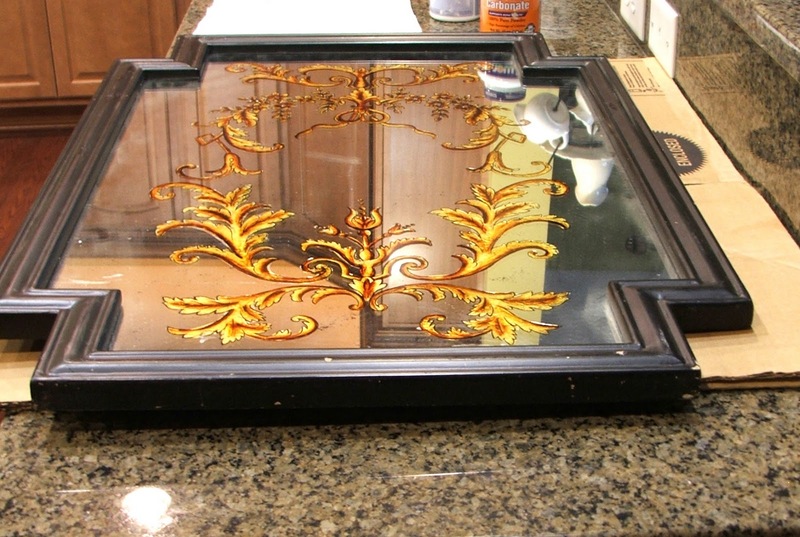 Lovin' what you did with the mirror frames – love the mirrors! I haven't even pulled out the "Fall" boxes yet. Your decorations look beautiful. Very pretty touches of Fall! Your mirrors turned out gorgeous! And thank your for the chalk paint Tutorial! I have been wanting to try it but it is so expensive. Also, your Fall decor is just lovely! Visiting from NTT. Have a wonderful evening! Your mantke is just amazing!! I don't think I have ever seen a prettier one!! It looks just so perfect in your room. I'm glad you didn't let the negative comments about the chalk paint recipes stop you from using it and writing about it. Those comments must have come from people who sell the more expensive brand. Sherry, it is fabulous! Your house is so gorgeous, I can't believe it is not sold! I went to auction Zip, and could not believe all of the auctions! Thank you I bookmarked it and will use it when I am in the market for more goodies. I know I got great things and better prices, hope my first auction was not the best and that their will be more to come! 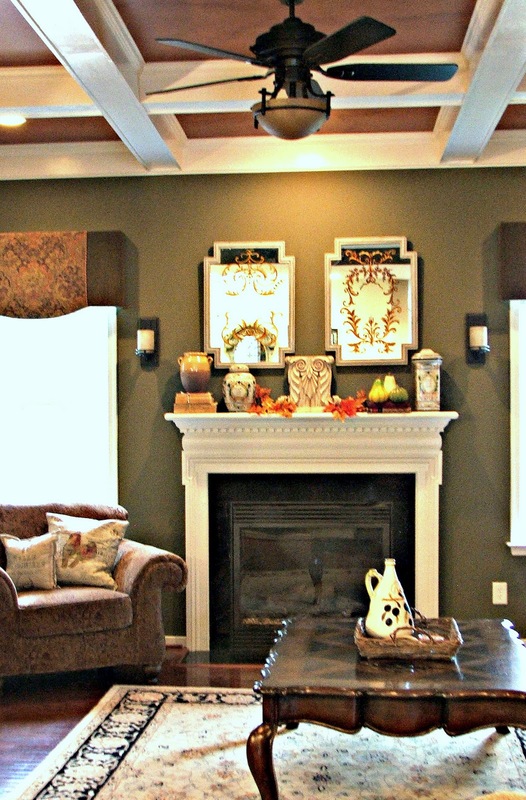 Sherry, your mantle is gorgeous! I love the mirrors! So pretty! Everything is just lovely! I know what you mean about getting a good picture! I have dark walls they "eat" light! LOVE those mirrors and you were so smart to paint them white. They look gorgeous with your walls!!!!! I am so happy to get your source for calcium carbonate. I'm trying your recipe… the urn turned out just lovely! I'm going to have to try your chalk paint~I made some not too long ago using glue and a bunch of other stuff, and I have to say, it was a colossal flop! But, now I have the calcium stuff, so it's all good. I like all your fall decor! LOVE the urns! Can you ever have enough?? Really beautiful Sherry. I think I will try to make the chalk paint. Have you tried ASCP? If so do you see a difference? Beautiful. I think everything is prettier in a coat of chalk paint. Those mirrors are fantastic. That is the first I have heard of a homemade chalk paint so I am definitely going to visit that. I need to be sure and link up for the party. Love the mirrors, and your mantle Sherry. Love that your doing the diy chalk paint! Your mirrors look fantastic! I need to try your chalk paint recipe. Sherry, I've gotta try that diy chalk paint! Everything looks amazing. I love those mirrors! I LOVE your family room Sherry! Love it! Your mirrors turned out beautifully. The urns are really so pretty. Everything you have "touched" with the chalk paint looks fabulous! My favorite is the taller urn with the string of goards…the creative painting technique that you did brought out the designs on it(in a good way). 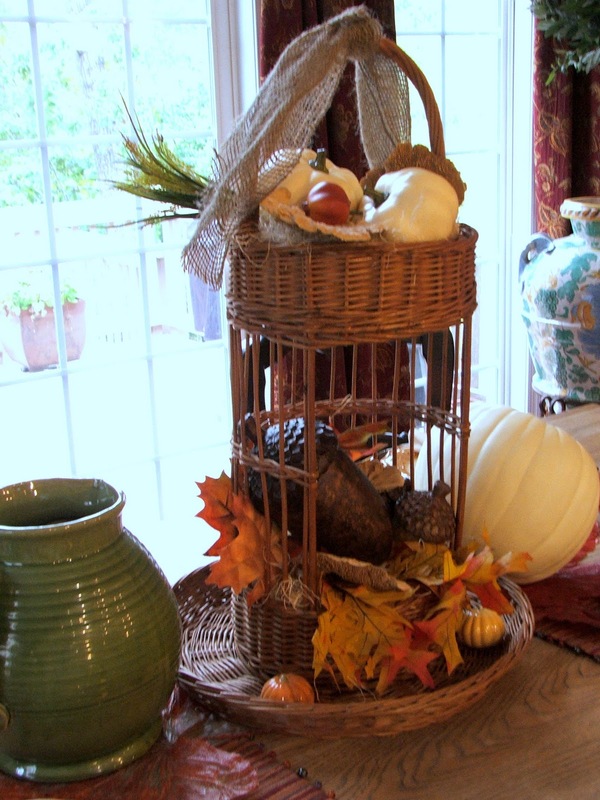 Your home is just so lovely…your Fall decorating just makes it more so. I saw this post over at Savvy Southern Style (I don't know how I missed it on my regular 'feed' of favorite blogs). Thank you for the chalk paint recipe…I agree…the other is much too expensive. Your decor is absolutely beautiful. You have been so encouraging to me by your kind comments on my blog. 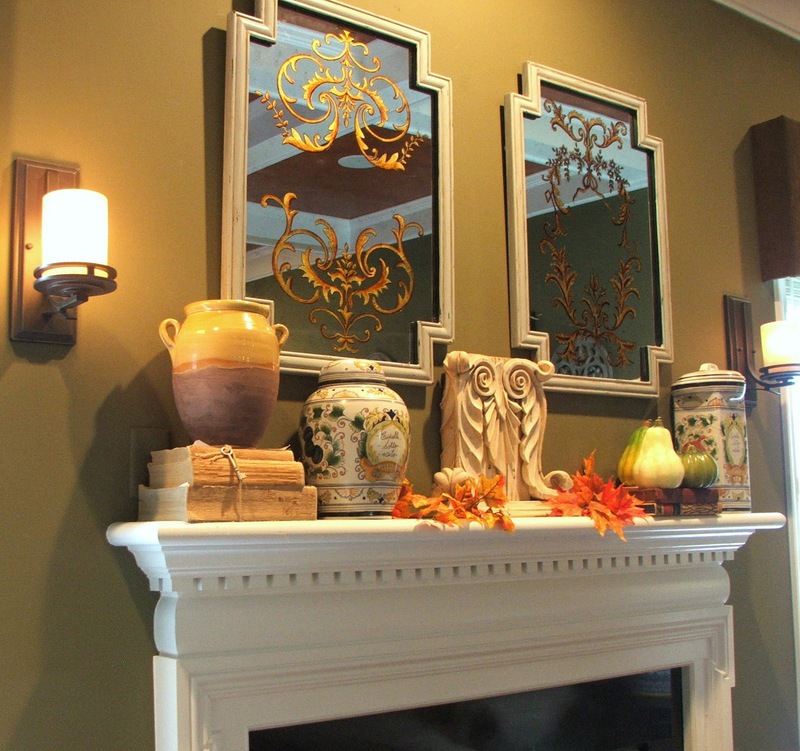 I never would have thought of putting two mirrors above the mantel, because I'm normally a one mirror kind of person. But it works! Love the paint job you did on them too. Can this be used on 60 year old pine woodwork that has a varnish or shellac on it? Thanks!